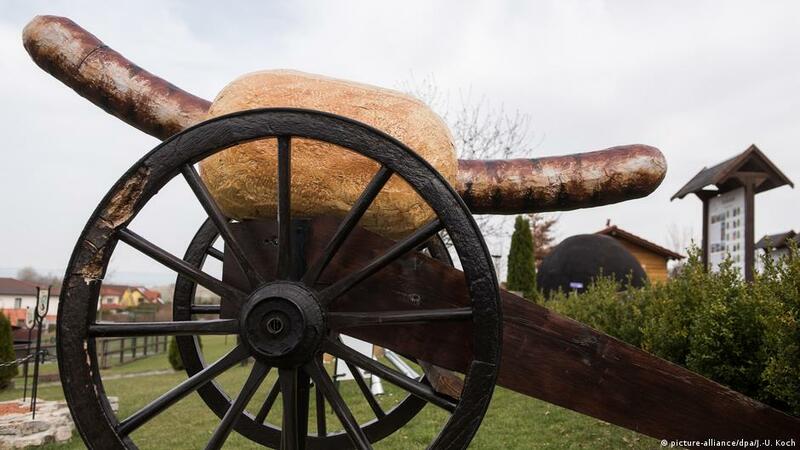 Councilors in the central German city of Mühlhausen have decided on a new location for a sausage museum after original plans to move it to the site of an annex to the notorious Buchenwald concentration camp met with outrage in several quarters. The new site, though only a stone’s throw from the first, is reportedly free of any troubled historical associations, Germany’s dpa news agency reported. THERE ARE NO SITES IN GERMANY FREE OF ‘TROUBLED HISTORICAL ASSOCIATIONS’. Tuna fish, calzone, and then “Boring Pizza”. Let’s look at what makes this pizza “boring”. The first ingredient is Pastirma. Pastirma (g) is dried beef. It was originally invented by Turkic nomads, who hung specially-prepared cuts under their saddlebags to dry as they rode in the desert. It may well be the origins of Pastrami, which was brought by Romanian Jews into Europe. Although only the shape is similar; pastrami is not dried. The next ingredients are mushrooms and artichokes, which are boring enough. But then comes Zwiebellauch. Odd: I can’t figure out exactly what Zwiebellauch (onion-leek) is in English. There’s no entry for it at the LEO website. There’s only one entry for it at linguee, which is pretty startling. They call it “chives“, but I don’t think that’s right. Wikipedia re-directs you to Winterzwiebel (winter onion), one of whose alternate names is Lauchzwiebel — but not Zwiebellauch. So what the hell is Zwiebellauch anyway? Little help here? Also, why is this pizza boring? I asked the owner, but he only smiled. I’d say an exotic delicacy from the Inscrutable Orient™ and an unclassifiable mystery vegetable makes this the most exciting goddamn pizza on the menu. But what do I know? Don’t worry, the neighborhood (Bilk) is still ‘diverse’ and ‘vibrant’ in the good way: almost 1 in 4 of the people who live here is a foreigner, like me. But the kooky young kids with their fresh ideas do liven the place up. I will post a report once the store opens. This is the store-brand variety of peanut butter sold by the large German discounter Real (“original from the USA”). When I first landed lived here for stint in 2001, peanut butter was impossible to find. If you wanted some, you had to go to a specialty American/British food shop and pay outlandish prices. Today, you can get peanut butter in at least 75% of all grocery stores — even the discounters — here in Düsseldorf. The same goes for other delectable treats such as genuine maple syrup, real Cheddar cheese, and “breakfast bacon” which you fry up with eggs. When I first came here, nobody had heard of “bacon”, and they reacted with puzzlement when I told them I planned to fry it up — why would you do that to a nice cut of smoked pork? I told them: “because frying it makes it 100 times as delicious.” And then proved it by giving them some. Now you can get “Breakfast Bacon” in any store. When I go to the farmer’s market, the nice lady offers to cut my pork “bacon style”, and I’m not the only one ordering it that way. Maybe this is just Düsseldorf, it’s a pretty cosmopolitan place. But I bet the trend is bigger: with modern transportation and logistics, it’s pretty easy to make and sell a niche product, even in a fairly small store in a small town. I find this is all good. Bacon, cheddar cheese, maple syrup, and peanut butter are objectively delicious, which is why some Germans end up liking them when they try them. Just as most Americans and Britons fall in love with German bread and sausage. If there is a trade war, I am sure some enterprising German firm will learn how to make peanut butter well, and immediately fill the gap. One of the things Germans are very good at is imitating the culinary delights of other cultures. And peanut butter is the simplest thing in the world to make. Maybe I’ll just make my own, and begin selling it on the streetcorner. Last week, I tasted quince for the first time in my life. Before I came to Europe, I had never even seen a quince, and didn't even know what the word meant, except that it sounded funny, and was apparently something you could eat. The very strong perfume means they can be added in small quantities to apple pies and jam to enhance the flavor. Adding a diced quince to apple sauce will enhance the taste of the apple sauce with the chunks of relatively firm, tart quince. The term "marmalade", originally meaning a quince jam, derives from marmelo, the Portuguese word for this fruit. Quince cheese is firm, sticky, sweet reddish hard paste made of the quince fruit, originating from the Iberian peninsula. It is known as dulce de membrillo across the Spanish-speaking world, where it is used in a variety of recipes, eaten in sandwiches and with cheese, traditionally manchego cheese, or accompanying fresh curds. In Chile, boiled quince is popular in desserts such as the murta con membrillo that combines Chilean guava with quince. In the Balkans and elsewhere, quince eau-de-vie (rakija) is made. For a quince rakija, ripe fruits of sweeter varieties are washed and cleared from rot and seeds, then crushed or minced, mixed with cold or boiling sweetened water and winemaking yeast, and left for several weeks to ferment. Fermented mash is distilled twice to obtain an approximately 60% alcohol-by-volume (ABV) liquor. It may be diluted with distilled water to obtain the final product, containing 42-43% ABV. So the other day, at the farmers' market, I had Afflatus # 1, and bought a bottle of quince nectar. You're never too old to try something new. Then I had an afflatus #2. I stopped by the Polish shop and bought a bottle of Grasowka Polish vodka, which is flavored with the aromatic scent of European bison grass. Each bottle contains one blade of the grass, although it's strictly ornamental. I mixed one part vodka with three parts quince nectar and one part mineral water, and of course ice, since I'm American. The result was a pale honey-colored liquid that was sweet but not cloying, refreshing and full of interesting overtones. Quince juice tastes like apple juice, but has a faint citrusy overtone and more tartness. I hereby freely grant this cocktail recipe, in perpetuity, to the entire human race. That's just how I roll. Alcohol abuse occurs when alcohol consumption leads to a contradiction between socialist moral requirements and a socialist lifestyle, on the one hand, and actual behavior, on the other. Since most of us now drink and live a life in contradiction to fundamental socialist principles, we are all alcoholics. I find that strangely reassuring. I saw a child burst into tears at the sight of BiFi. I almost did myself. Koi pla is a popular dish in northeastern Thailand. It’s made from finely chopped raw fish, mixed with herbs, a dash of lime juice, and a sprinkling of live red ants. Although devoured regularly by many in the Isaan region of the country, the dish actually harbors a deadly secret: it causes liver cancer. For a long time now, it’s been observed that people in the region have bizarrely high levels of the disease. It’s thought to account for more than half of all male cancer cases in the region, compared to a worldwide average of around just ten percent. And it’s the little freshwater fishies used in the dish that are the culprit, or more specifically, the fluke worms they’re home to. Doctors in the area are trying to educate people as to the risk koi pla poses, reports BBC News Worldwide, and it seems to be working. Raw fish and live red ants? Jesus traditional Thai cuisine, go home. You're drunk.